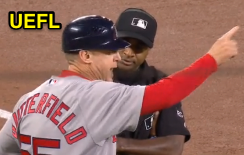 3B Umpire Alan Porter ejected Red Sox 3B Coach Brian Butterfield (Replay Review/slide rule interference no-call by 2B Umpire Andy Fletcher) in the bottom of the 8th inning of the Red Sox-Orioles game. With none out and one on (R1), Orioles batter Mark Trumbo hit a 3-2 slider from Red Sox pitcher Joe Kelly on the ground to shortstop Xander Bogaerts, who threw to second baseman Dustin Pedroia as Orioles baserunner R1 Manny Machado slid into second base, ruled out by 2B Umpire Fletcher on a ruling challenged by Orioles Manager Buck Showalter (pulled foot), and confirmed by Replay Review; Farrell did not challenge this play and Fletcher ruled that, due to the poor quality of Bogaerts' throw, Pedroia was not "hindered and impeded [in his] ability to complete a double play," pursuant to MLB's previously-issued interpretation regarding slide rule interference.^ Replays indicate Pedroia fielded the throw and tagged second base prior to Machado's touch of the base, and that Machado engaged in a bona fide slide into second base; although his foot 'spiked' and injured Pedroia, replays indicate that the Machado's right foot incidentally slid off the top of second base and into Pedroia's ankle after he began the slide before second base, reached the base with his foot, remained on the base with his left foot (complicated by Machado's attempt to brace Pedroia), and slid within reach of the base without changing his pathway for the purpose of initiating contact with Pedroia: though the contact was significant, this is not a violation of the bona fide slide interference rule, the call was correct. * At the time of the ejection, the Orioles were leading, 2-0. The Orioles ultimately won the contest, 2-0. This is Alan Porter (64)'s third ejection of the 2017 MLB regular season. Alan Porter now has 11 points in the UEFL Standings (4 Previous + 2 MLB + 3 Correct Call [C] = 11). Crew Chief Hunter Wendelstedt now has 2 points in Crew Division (1 Previous + 1 Correct Call = 2). ^In May 2016, MLB added impediment to its bona fide slide rule interpretation, noting that in order for slide interference to be called, "the Replay Official must still find that the runner's actions hindered and impeded the fielder's ability to complete a double play." A runner who engages in a “bona fide slide” shall not be called for interference under this Rule 6.01, even in cases where the runner makes contact with the fielder as a consequence of a permissible slide." This is the 10th ejection report of 2017. This is Boston's 1st ejection of 2017, 2nd in the AL East (TB 2; BOS 1; BAL, NYY, TOR 0). This is Brian Butterfield's first ejection since August 18, 2016 (Scott Barry; QOC = Y [Balls/Strikes]). This is Alan Porter's 3rd ejection of 2017, 1st since April 20 (Paul Molitor; QOC = Y [Check Swing]). 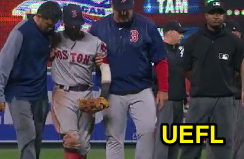 Wrap: Boston Red Sox vs. Baltimore Orioles, 4/21/17 | Video via "Read More"